On a rainy 28th September 1992, during a watching brief on the development of a new section of the A20 in Dover, Keith Parfitt, of Canterbury Archaeological Trust (CAT), spotted a thin band of wood and a twisted fibre rope at the bottom of a 6m hole being dug for the construction of a pedestrian underpass. At first he thought it may be a further part of the Roman harbour wall found a couple of weeks earlier, however, upon closer inspection, and clearing away more sludge, Mr Parfitt realised its true identity – part of a Bronze Age sewn-plank boat (Keith Parfitt, pers. comm.). The work on the road was halted and other archaeologists and experts called in from CAT, English Heritage and elsewhere. The excavation proceeded, quickly, with many difficulties and complications, resulting in the craft being cut up, into at least 32 pieces, to enable its recovery (Parfitt in Clark, 2004a, 9 – 22). Over the next few years the pieces were conserved, with the help of experts from the Mary Rose Trust, and the boat was reconstructed and put on display in Dover Museum in its own specially designed case. It has become one of the most visited sites in a town which has many other attractions, and still draws in plenty of academic and media attention because of its significance to the study of many aspects the Bronze Age in Britain. So, the Dover Bronze Age Boat is significant, is it because it is the only one ever found? Not at all, there are nine other Bronze Age boats known in Britain, admittedly some are just represented by a plank or planks, but they have all been confirmed as being parts of sewn-plank boats. In fact one of the experts brought in to give advice on the rescuing of the Dover boat was Dr Edward Wright who, 30 years earlier, had found three of the five boats unearthed at North Ferriby, Humberside/East Yorkshire (Wright in Clark, 2004a, xi) between 1937 – 1963. The Dover boat is the only one, however, found in the south-east of England; although a Bronze Age sea-going vessel could be implied from the Langdon Bay Hoard found off the coast near Dover in 1974, which included Bronze Age axes of a type made in France (Harding, 2000, 182). There is also the significant fact that they have all survived to be subsequently found. Well then it must be the oldest? 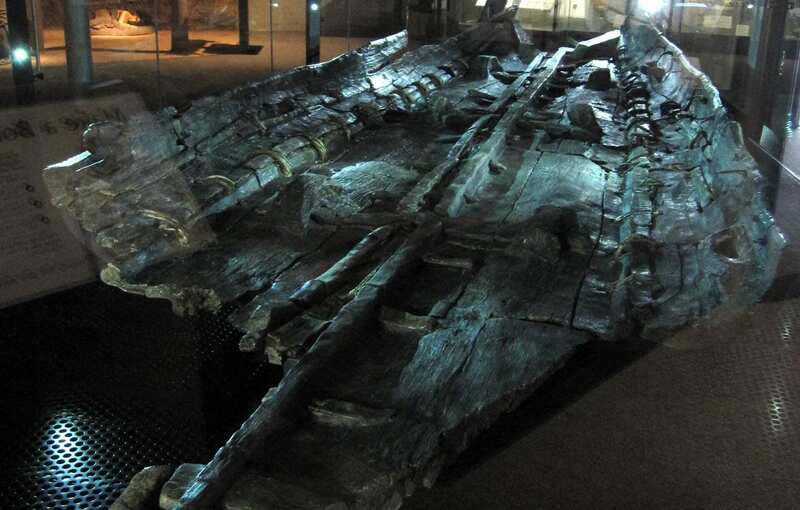 The Dover boat has been dated by Accelerator Mass Spectrometry (AMS) to between 1575 – 1520 BC, Middle Bronze Age, but five others are older – Ferriby 3, especially, could be over 400 years older – so no, it is not the oldest. The wide spread of dates has subsequently led to speculation that the sewn-plank method was widespread throughout Britain for an extended period of time; ‘…these elaborate boat designs were the product of a long lineage, of perhaps several centuries’ duration’ (Wright in Clark, 2004a, 260 – 1). Its design has some unique aspects compared to the others, and that is why it is significant? Not really, the designs do vary but the basic construction; joining planks by sewing them together, almost like attaching a sleeve to a knitted jumper, is the same for all. Furthermore; although ‘a number of technological aspects is [sic] shared, each boat has also certain unique design characteristics’ (van de Noort, 2006, 273) for example; ‘whereas Ferriby 1 and Ferriby 2 have their two keel planks joined amidships, the Dover boat’s seam was formed by two planks joined by an upstanding longitudinal cleat rail’ (Marsden, 2004, in Noort, 2006, 273). There also seems to be two different types of stitching; individual or continuous; ‘Individual stitches … held the Ferriby planks together but also locked the essential plank seam-joints, while the overall plank stiffness prevented them from slipping out of contact’ (Roberts, 2006, 73) and ‘The Briggs Craft [using continuous stitching] indicates a change to sewing but only to keep the strake seams in contact while frames are used to maintain hull shape’ (Roberts, 2006, 73), and comparing the build dates suggests that continuous stitching was a technological development as it seems to be used in the more recent boats’ construction. The method of using withies to hold planks together was used until the invention of nails; the earliest recorded use of tree-nails, for example, is in the Appleby dugout canoe which has been radiocarbon dated to 1525 – 1315 BC (Marsden in Clark, 2004b, 17). Moreover, Goodburn freely admits that; ‘it is clear that the Dover boat’s builders were not a uniquely skilled team’ (in Clark, 2004a, 160), these types of boats were being built all over England and Wales. The Cheops boat, made in a similar way, found in 1952 near to the Pyramid of Cheops, was joined together by stitching and dated to c. 2,600 BC, is the earliest form of sewn-plank boat known (Johnstone, 1980, 70). Very interesting but back to the question of significance – the Dover boat must be the most complete one then? Almost but not quite, in fact there was more of it in the area it was found, the ‘north’ end which may have been as much as 6m long, is still buried as it was not feasible to excavate all of it at the time because of the danger to nearby structures and financial considerations (Parfitt in Clark, 2004a, 17). What was recovered consisted of its; ‘two bottom planks, the corner planks between the bottom and each side, and the lower part of one sloping end’ (Parfitt in Clark, 2004b, 17). The Ferriby 1 boat, though, has got more of both ends as well as the base and the Briggs ‘raft’ may have been longer than both originally. (The Cheops boat is complete but as it was deliberately dismantled before burial, and it is not British, we cannot really compare it). Maybe the type of materials used for the Dover boat were different from the others? No, oak was the wood of choice for all the British boats basic structures (no evidence of seaweed has been discovered though). The Dover boat, specifically, had oak planks, timbers, wedges and laths (a narrow strip of wood used to cap seams inboard), (strangely one lath was hazel – maybe a repair?) along with yew withies moss wadding/caulking covered the plank seams, plus a, probable, mix of wax, resin and animal fat stopping to make stitch holes waterproof (Clark, 2004a, 211). The Briggs ‘raft’ used willow for the stitching instead of yew but the remaining boats all use the same materials as the Dover boat, they just used what was available (The Cheops boat is cedar) and, probably (looking at the dates) ‘Prehistoric boat building skill could only develop slowly because of the technology of its tools and its building tradition (things known to work)’ (Roberts, 2006, 77). All right, so the actual boat itself is not particularly unique or significant, so did the Dover boat contain lots of unusual and unique artefacts? Near to the Goldcliffe plank were some human skulls, with Caldicot 2 was a Wiburton-type chape, two ceramic vessels, an amber bead, wooden objects and a dog skeleton, there was a bronze axe, spearhead, pin, pottery sherds, human and animal bones with the Brigg ‘raft’ and an Bronze Acton 2 rapier near to the Testwood plank (van de Noort, 2006, 277). Additionally all that seems to have been found near to the Ferriby boats (keeping in mind the time in which they were excavated and the difficulties encountered in an intertidal situation) were oak chippings which have suggested, and considering the number of boats found in close proximity to each other, a possible boatyard (Chapman, 2004, 453). The artefacts found within and near to the Dover boat, however, consisted of; flints (including burnt ones), debitage, pottery sherds, a fragment of Dorset shale, a butchered animal bone, reeds and a single, seemingly unused, yew withy, most of which may be refuse from a nearby settlement, although the flint tools could have been used to aid in the dismantling of the side boards of the boat before deposition. There were also some rough chalk blocks which may have been used as stepping stones to get to the boat (Clark, 2004a, 211). There was also a selection of sediments composed of ‘marine shell fragments with unusually large amounts of quartz sand’ as well as glauconite grains from the Lower Cretaceous Greensands at Folkestone (approximately 7 miles south-west of Dover) (Marsden in Clark, 2004b, 18) possibly suggesting the transportation of goods (possibly greensand quernstones) from the known Bronze Age settlements there, up and down the coast, and possibly further. So although it had no particularly unique or unusual artefacts they can still contribute to its story. Was it a ‘sea-going’ vessel then? Now this is a question which is still being debated by many archaeologists, and not just regarding the Dover boat but the Ferriby and Briggs ones too. Noort points out that; ‘if we ask whether these boats could have occasionally crossed the North Sea [or the Channel] then the answer is most probably affirmative’ (in Clark, 2004b, 92). Harding believes that there is no other explanation other than that the Dover boat operated in the Channel (2000, 181) although he also claims that until the discovery of it in 1992 the ones from Ferriby were thought; ‘suited only to riverine traffic’ (2000, 184), however, Roberts notes that a recent reconsideration of photographs taken of the bottom of Ferriby 1 during its recovery ‘revealed the sweeping rocker now generally accepted’ to indicate sea-going capabilities (2006,73) and, rightly, points out that all assumptions or conclusions regarding Bronze Age seafaring are based on a tiny sample of examples and are ‘necessarily made with caution’ (2006, 77). Van de Noort also suggests that; ‘recent findings imply that sewn-plank boats were the most likely candidates of craft being employed for seafaring and directional exchange in the Early Bronze Age’ (2006, 283) referring to the fact that our main evidence for cross-channel trade is artefacts; ‘Land-based archaeological evidence increasingly shows these communications to have been extensive’ (Coates, 2005, 38). The planks from Goldcliffe and Caldicot ‘show the significance of the Severn Estuary for communications and trade’ (Chadwick, 2008, 2). In fact, all the imports found in Britain must have got here somehow, consequently either we went there or they came here in some kind of sea-going vessel, for example; ‘Pots from Brittany have been found in burials in Wessex on the Isle of Wight’ (Parker Pearson, 1994, 109) and ‘Gold ornaments crafted in Wessex have also been found in Brittany’ (Parker Pearson, 2005, 87). However, although Parker Pearson agrees that people were making coastal trips he seems to imply that they may have made trips that would involve losing sight of land (1994, 109), but on a clear, calm day, when the experienced seamen knew it was relatively safe to make the journey, you can see France clearly from Dover and Folkestone, and visa-versa. And Champion points out the nodal position of Kent and the wide range of contacts that can be assumed from the artefacts discovered which makes it ‘seem very reasonable to suppose that many of these contacts were made by sea’ (in Williams, 2007, 95). Cunliffe supports these assumptions further by stating unequivocally that evidence of trade from an early time can be proved from the innovations that appeared; ‘partly because of widespread trading contacts, particularly with northern and western France, which were maintained over several centuries’ but he also credits the locals with many technological advancements (2009, 56). There are archaeologists, though, who do not believe that the Dover boat was sea-going, for example; Marsden has re-evaluated his ideas and now believes that unless the vessel had substantial strengthening, of which there is no evidence, it could not have made the Channel crossing, and he is even dubious about it making long coastal journeys (in Clark, 2004b, 19). Even Clark himself admits that; ‘There is no direct evidence for the conditions the boat operated in’ (2004a, 312) but he conversely goes on to say that there is no technical reason why the boat could not make it to France. Sean McGrail, Professor of Maritime Archaeology at the University of Southampton, has recently intimated that the criticism by Crumlin-Pedersen of Owain Roberts’ theoretical reconstruction in Clarks’ The Dover Bronze Age Boat, which came down overwhelmingly on the side of it being a sea-worthy craft (in calm, clear weather), is justified (2007, 255-6) and that much more research, and actual reconstructions, need to be undertaken before this question can be answered conclusively. Right, running out of ideas now, um, er, how about the context it was found in then, is that why? Well, like the others, it was found near to the coast, next to a river. The River Dour, in the Bronze Age was ‘a braided network of shallow streams running down to the sea’ (Clark, 2004a, 312) and therefore somewhat unsuitable for this type of boat and, as Parfitt and Champion point out there is currently no direct evidence for any settlement nearby either(in Clark, 2004a, 264). Conversely, the Kilnsea plank was found near to a rich BA (and Neolithic) landscape but Chapman and Gearey believe that it was not from there; ‘its presence near to the ‘Monumental’ landscape is arguably coincidental’ and that the archaeological evidence does not support the theory that there was a landing place nearby (2004, 453). The planks from Goldcliffe, Caldicot and Testwood were discovered either in or very close to contemporary wooden structures (bridges, harbours or trackways). The Ferriby and Brigg boats were discovered on the banks of the Humber Estuary whereas the only known contemporary site is a nearby trackway (Chapman & Gearey, 2004, 454) furthermore, ‘The reasons for the original site for maritime activities during the Early Bronze Age, and its apparent longevity of use, are likely to include a range of factors’ (Chapman & Chapman, 2005, 48) including availability of raw materials, manpower, pilotage and navigation with the nearby red-coloured cliffs being decent landmarks for just this purpose. So there does seem to be practical reasons for these boats to be found where they were, but are there reasons for them to have been deposited there. For example, if, as has been suggested above, the Dover boat was not a riverine vessel why then was it deposited, and seemingly partially dismantled, in a river location? The straight answer is; we do not know! It could be because of ‘ritual’ or secular reasons, there are, even today, many superstitions relating to boats; blessing the fleet, smashing a bottle when launching a ship, crossing the date-line and so forth, there are also rituals involved in disposing of vessels. Clark suggests that; ‘A number of things suggest a series of actions designed to mark the end of the boat’s life’ including the dragging of it upstream to a valley setting, the removal of the side panels (which may have been reused like the planks from Goldcliffe and Caldicot), destruction of the end panel, and damage to the eastern ile, leading to a ‘ritual’ killing of the boat (the piece of Kimmeridge shale placed inside could also have been placed there), ‘boats may be methodically dismembered, burnt or intentionally sunk as part of a decommissioning ceremony’ (Adams, 2001, 295). However, the damage could have been accidental and the the planks used for another boat or for a house, that just leaves the question of why it was there and ‘one explanation for her loss could be that severe weather drove her from her usual operational area in the Wantsum Channel … until she was deposited in the River Dour at Dover’ (McGrail, 2007, 256), although there is no archaeological evidence for this theory. There, then, appears to be nothing uniquely significant about its deposition compared to the others. Ok, I give up; HOW SIGNIFICANT IS THE DOVER BRONZE AGE BOAT ? It is significant for all the reasons mentioned above (What?) but also because it proves that far from being insular, Bronze Age people were socially co-operative; ‘The construction of vessels … must have represented a considerable investment of a community’s time and resources’ (Chapman & Gearey, 2004, 455). Clark points out that it may have been a shared resource of a number of scattered households transporting their own produce as well as newly found items such as metal (2004a, 321). ‘The more robust plank boats would have extended the windows of opportunity to gain access to the goods and ideas that facilitated the expression of rank and status…’ (van de Noort, 2004, 47) suggesting that, apart from basic trading opportunities, owning imported (exotic) items increased an individuals (and by osmosis his family or clans) status amongst his neighbors. Consequently, because, especially in the Dover area, a possible market could be seen (or maybe the Gauls popped over first) spending a significant period of time chopping down trees and making planks and laths, sourcing and collecting other materials, organising the teams of builders, making paddles, learning how to move and steer the boat, navigation, watching the tides and weather, and so forth, it would probably seem worth it. When I asked Andrew Richardson why he believed the Dover boat was significant he told me that it was because it proved that communities had to work together to construct something that will potentially benefit the whole area, but mainly because it shows a technological prowess previously unsuspected for the people of the Middle Bronze Age in the south-east. So how significant is the Dover Bronze Age Boat – very, to the people of Kent. Adams, J., 2001, Ships and Boats as Archaeological Source Material, in World Archaeology, Vol. 32, No. 3, pp 292 – 310. Johnstone, P. (Prepared for publication by Sean McGrail), 1980, The Seacraft of Prehistory. London: Routledge & Kegan Paul.